Gilbert Melendez spoke about Diaz brothers in the episode of Chael Sonnen’s “You’re Welcome” Podcast on Wednesday. “I would love to see him come back, but last time I checked, he’s retired,” the former Strikeforce champ Gilbert Melendez said on Wednesday. Nick Diaz (26-9 MMA, 7-6 UFC) hasn’t fought since UFC 183, which was held on January 31, 2015, when he faced Anderson Silva. The clash was overturned to no contest after both fighters were tested positive on prohibited substances. Nick was arrested in 2018 and charged for domestic violence assault but released on bail after paying $18,000. Despite prosecutors added him two more felony charges, the Clark County (Nevada) District Attorney wasn’t interested in pushing the case further, and all charges were dismissed. Bodycam video showed he didn’t resist arrest too! 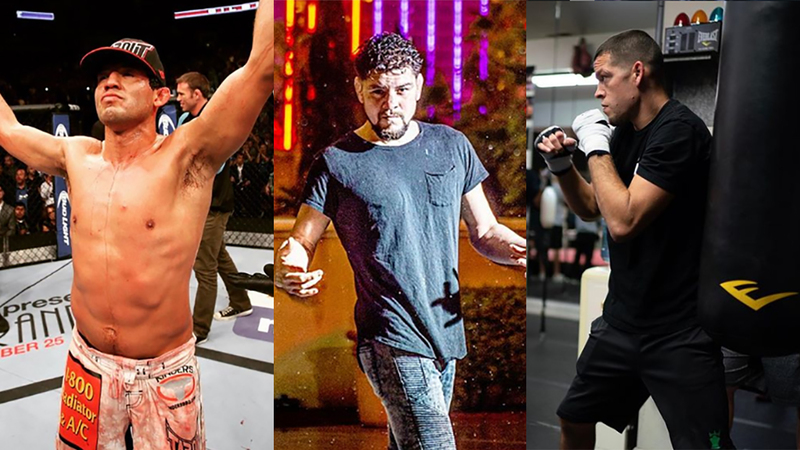 Nick Diaz was linked for UFC 235 clash versus Jorge Masvidal. Yet, Nick turned down talks of “Gamebred” fight, claiming he “has never agreed to that match”, and accused promotion of trying to “lowball” him. Gilbert Melendez believes the elder Diaz brother could fight again if the circumstances are right. “If anyone could come back and do it, and stay on track and everything, it’s him,” Melendez said. Gilbert Melendez claims there are no roadblocks for Nick’s return. Nick Diaz was officially cleared by USADA in April 2018 after serving a one-year suspension for a whereabouts failure. Melendez also believes the elder Diaz is in great shape and always ready. Nate Diaz (19-11 MMA, 14-9 UFC) didn’t fight since UFC 202 when he lost to Conor McGregor via majority decision. The younger Diaz brother was set to meet Dustin Poirier in the co-main event of UFC 230. Yet, the match didn’t come to fruition because “The Diamond” suffered a minor injury, and Dana White wasn’t interested in keeping Nate Diaz on the fight card. But what happens with Nate Diaz at the moment? Gilbert Melendez claims he is an A-list businessman who hangs out with celebrities, lives a good lifestyle, and trains hard. “He’s training hard,” said Melendez, who was part of the famed “Skrap Pack” of Northern California fighters that included the Diaz brothers. “His brand is huge. He’s so dang famous; the guy’s an A-lister now. Everyone knows him where I go. Do you think Diaz brothers will fight again?